Density : 19,300 kg per cubic metre. Melting point : 1337.33 K (1064.18 °C). Boiling point : 3129 K (2856 °C). Nucleic neutrons (normal) : 118. Gold is a chemical element so it can only be found, not manufactured. It is largely inert, which means:- (i) It is almost totally immune to decay, (ii) it is not very useful in any industrial/chemical processes which use it up and (iii) it is easy to store cheaply for long periods. It is remarkable for its rarity, density, softness, and its very good electrical conductivity. Gold finds a small number of industrial uses arising from its physical qualities. It is used in dentistry and in the manufacture of some electronics which require high quality non-corrosive contacts. Gold is extremely rare. According to all geological experience it is found almost entirely in low concentrations in rocks. Nuggets are an exception, but account for the tiniest portion of discovered gold. Interestingly there is also gold in solution in seawater, however although the aggregate quantity is large (because the oceans are huge), the concentration is low and renders extraction beyond any reasonable technology. The cost of pumping 1,000 tonnes of seawater for processing would considerably exceed the tiny amount of gold it would yield. Gold's average concentration in the Earth's crust is 0.005 parts per million. The technology of extraction is expensive primarily because the process always requires the manipulation of large physical quantities of ore for small results. The energy required to heave, grind and process ore is itself valuable and places a lower limit on the quality of ore which can be profitably worked. Rising energy costs always impact mining viability. At different points concentration of minerals within the earth's crust varies from their average, and it is those variations which produce workable ores. Iron, for example, accounts for an average 5.8% of the content of the Earth's crust. It needs to be concentrated by natural variations to about 30% to be considered an ore, indicating a required geological concentration of about 5 times. A lower grade gold ore would contain something like 5 grams per tonne (5 parts per million). So gold ore needs to be concentrated by about 1,000 times above the average to become viable. The process of gold concentration happens both above and below the surface of the Earth. On or near the surface there is alluvial gold which has been concentrated by the effects of running water, for example in rivers. Because of its extreme density gold will readily fall out of suspension as water slows down. So where a river cuts through gold bearing rock, and then slows down as it hits a flatter/wider river bed, gold will concentrate in a 'placer' deposit, allowing extraction of gold particles by panning and the modern day industrial equivalents. The California Gold Rush of 1849 grew out of the gold deposits on the Sacramento river which were particularly accessible to this technique. 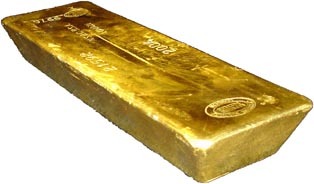 Note that London Good Delivery Bars - the main trading unit of bullion (illustrated) - are specified at a minimum of 99.5% pure. The gold jewellery trade is a permanent and global marketing initiative for bullion, and has for thousands of years gone hand in hand with un-worked metal in promoting gold as a store of material value. It creates a significant barrier to entry for any rival material and contributes to the security of gold, in bullion form, as a form of money. Throughout civilisation gold has been used as money, but the two are less closely related now than has been normal through the last 3,000 years. Modern currencies (like many older forms of money) can have their supply expanded by diktat, usually by a government or a central bank. All modern money is subject to government in this way, which means that the value of savings is decided, to an extent, according to a political agenda. Modern savers are exposed to any economic or political crisis which could cause money to be over-issued, so their long term prosperity depends on the reliability of the political mechanisms for imposing monetary scarceness. Historical precedent indicates it is not always in politicians' interest to keep money scarce. Because of its rarity gold reliably imposes scarceness, which is what occasionally makes it useful as money. Whether or not a physical manifestation of money - in the form of bullion - is a desirable thing is open to debate at any given time. But if a monetary material of reliable scarceness is desirable then gold is still as appropriate as ever. The investment question concerning gold is not whether or not it reliably imposes scarceness, which it does, but whether or not such reliable scarceness will in the future be required by savers. Because the significant majority of people currently believe that our governments and our central banks have sufficient skill to manage the supply of money, gold’s use as a monetary material has waned, especially over the last 70 years. This is a regular pattern. Gold will quietly slip into the background when paper money becomes widespread because, as the famous Gresham's Law says "bad money drives good money out of circulation". But part of the mystery of money concerns gold's cyclical re-appearance, which the following pages will aim to explain.